The Roland M-5000 O.H.R.C.A. Live Mixing Console pictured with the M-48 Personal Mixer Used as “Engineer’s Monitor” Control. The Roland M-48 Personal Mixing Management Control Screen from the New Version 1.101 Software. Los Angeles, CA, August 10, 2015 — Roland is pleased to announce a new software update, version 1.101, for the popular M-5000 O.H.R.C.A. live mixing console. 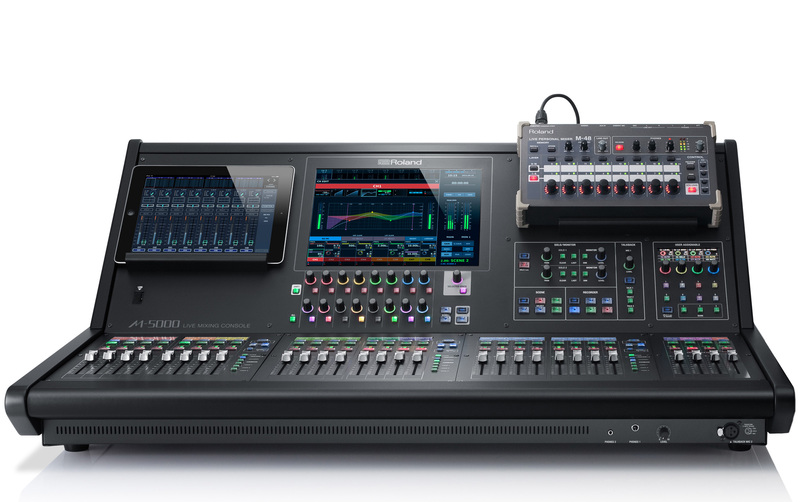 This new update equips the console with the latest M-48 Personal Mixing management and new GP I/O functions from the built-in 25-pin port on the rear of the console. These new features, coupled with Roland’s O.H.R.C.A. platform, open up new possibilities in control for worship, theater, broadcast and live production markets. Roland’s highly regarded M-48 Personal Mixing System provides 40 channels that are mixed as 16 stereo groups to each musician on stage via a cat5/6e cable and allows each musician to control their own mix. The new version 1.101 software allows the setup and control of each M-48 on the network directly from the M-5000. Users can set up two monitor mix zones using REAC A and REAC B ports, which allows a separate set of 40 input sources that can be assigned in 16 stereo groups, providing multiple monitoring mix options without taking up any console resources. The innovative Engineer’s Monitor function allows the sound engineer at FOH to mirror a monitor mix to a local M-48 at the console from any M-48 on the network, listen to it, make adjustments, and send it back to the musician on stage. Each M-48 can store up to 16 presets that can be recalled from the M-48, and those settings can be associated with scenes on the console, enabling automated memory preset recall of all personal mixers when a console scene is recalled. 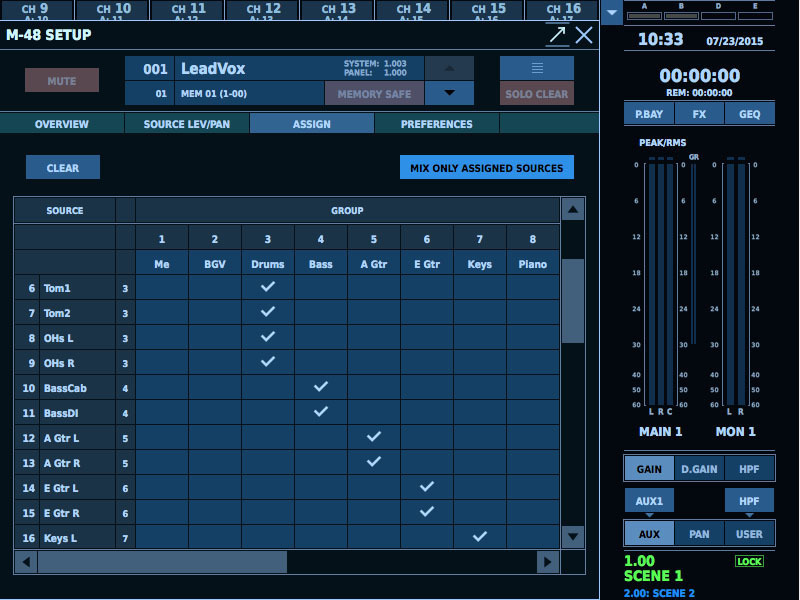 These new software features for M-48 personal monitoring ensure seamless integration and configuration from the console and sound engineer to each personal mixer and musician on the network. Additional version 1.101 software features include GP I/O control using peripherals such as foot switches or touch panels from contact closure inputs. On outputs, the M-5000 can send up to twelve GP I/O commands for fader, scene recall and user button control, which is highly valued in theater, broadcast and live production applications. The new version 1.101 software for Roland’s M-5000 is available for download from Roland’s Pro AV site at http://proav.roland.com/support/by_product/m-5000/updates_drivers/. Photo caption 1: The Roland M-5000 O.H.R.C.A. Live Mixing Console pictured with the M-48 Personal Mixer Used as “Engineer’s Monitor” Control. Photo caption 2: The Roland M-48 Personal Mixing Management Control Screen from the New Version 1.101 Software.